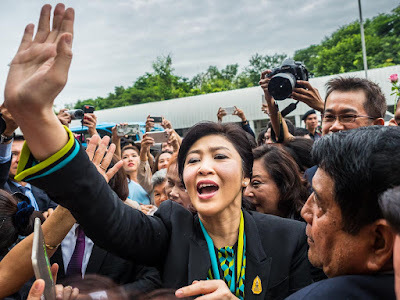 Yingluck Shinawatra, the former Prime Minister of Thailand, waves to supporters upon her arrival at the Supreme Court of Thailand Friday morning. Her government was deposed by a military coup in 2014. Yingluck Shinawatra was back in court today. 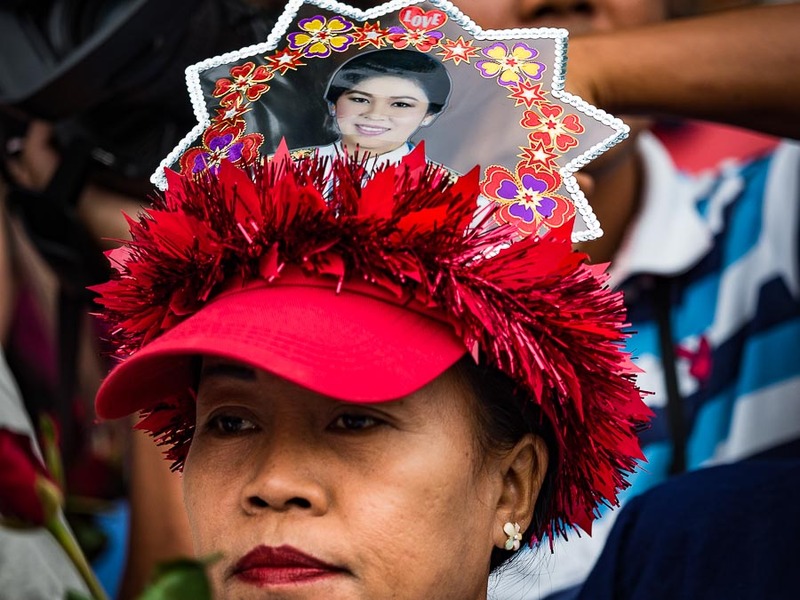 She's on trial for corruption and mismanagement of a rice price support scheme her administration started to help Thai rice farmers. The military government that overthrew her government has charged her with mismanaging the program. 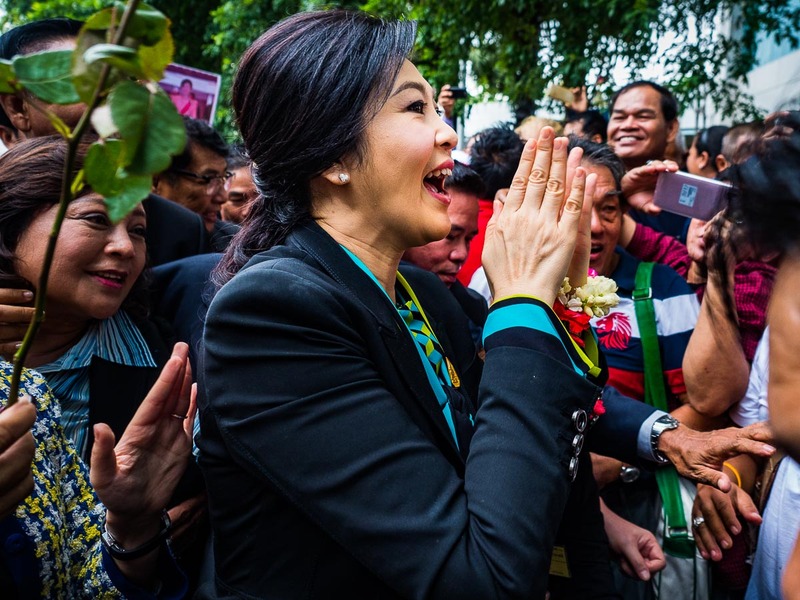 Although her popularity might have faded with many Thais, Yingluck is still very popular with her base and there were hundreds of people at the court waiting to catch a glimpse of the former PM. A supporter with a portrait of Yingluck stuck in her red hat. 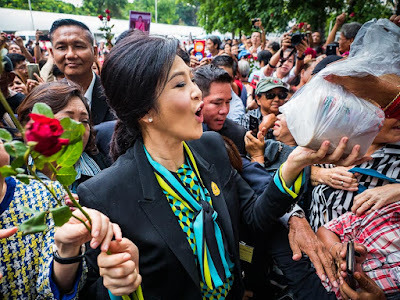 When she was elected in 2011, Yingluck won with a huge majority. She's the younger sister of the still very popular Thaksin Shinawatra, who was Prime Minister in the early 2000s. Thaksin's government was deposed by a coup in 2006 (you may see a pattern here) and he is in exile in Dubai because he's facing numerous charges of corruption (again, you may see a pattern here). 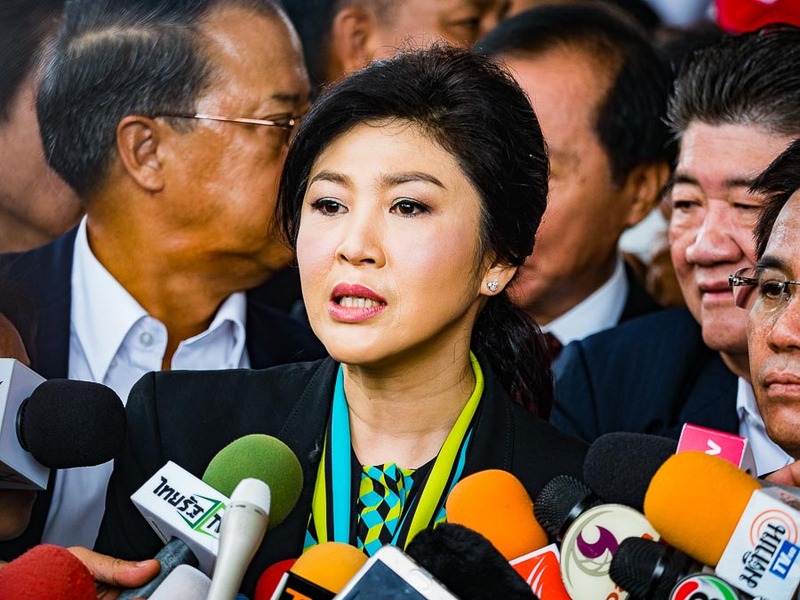 While Thaskin went into exile, Yingluck has chosen to remain in Thailand to fight the charges against her. I covered Yingluck's events quite a bit before the coup. She's not as polished a speaker as some Thai politicians but she's very telegenic and she connects with voters in a way that's hard for me to explain. She seems to be especially popular with older working class women. Most of her supporters at the court today were women 45 and older. 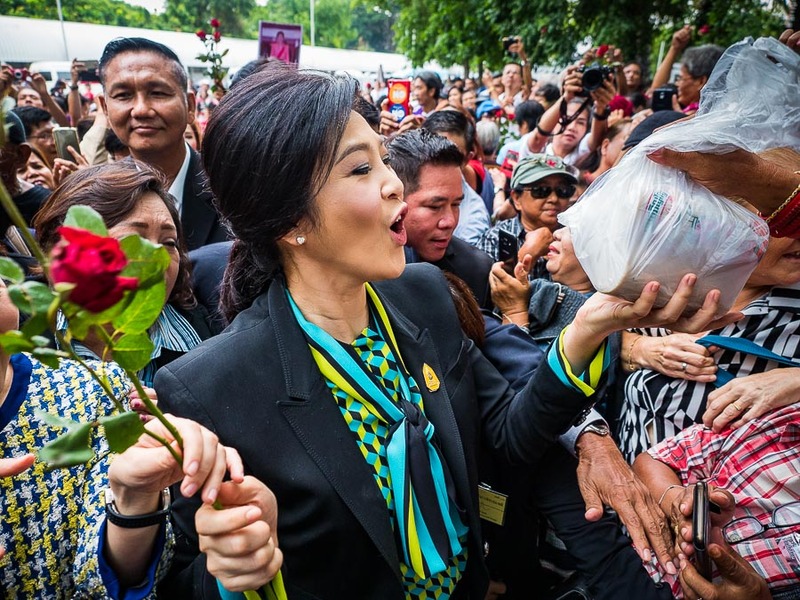 Yingluck walks through the crowd holding flowers women gave to her as she passed. Pandemonium broke out when Yingluck arrived. Some of the women waiting for her started weeping. Others chanted her name. Others sang what I'm guessing were songs made popular by her party, Pheu Thai, during the 2011 campaign. Thursday, the day before her court appearance, Yingluck appealed to her supporters to come to the court and they did not disappoint. There were hundreds of people at the court. I think it was the biggest Pheu Thai gathering I've seen since the coup. * The military dominated government has banned political gatherings, but they did not interfere with the crowd at the court this morning. And for their part, the crowd did not participate in any overt political posturing or taunt the military. Yingluck walks through the crowd and accepts flowers and gifts from well wishers. Yingluck speaks to supporters (and reporters) in front of the court building. Yingluck didn't spend much time in the crowd this morning. 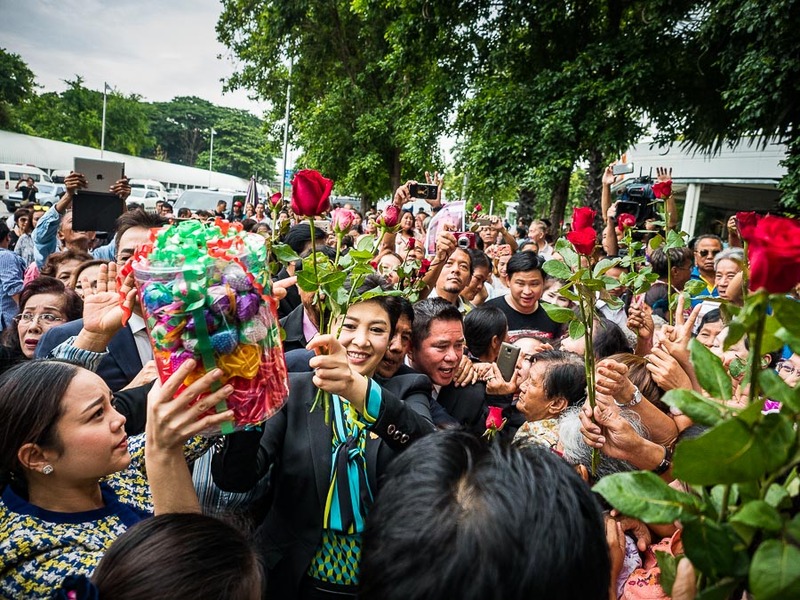 She pulled up to the court building just before 8AM and made her way through the throng of people, accepting flowers (mostly red roses) and small gifts from well wishers and made a few comments about her innocence before disappearing into the court building. Some of Yingluck's supporters have breakfast on the lawn in front of the court building. There are more photos of Yingluck's arrival at court in my archive or available from ZUMA Press. * Although this was the largest turnout I've seen since the coup, by Thai standards this was a very small crowd. 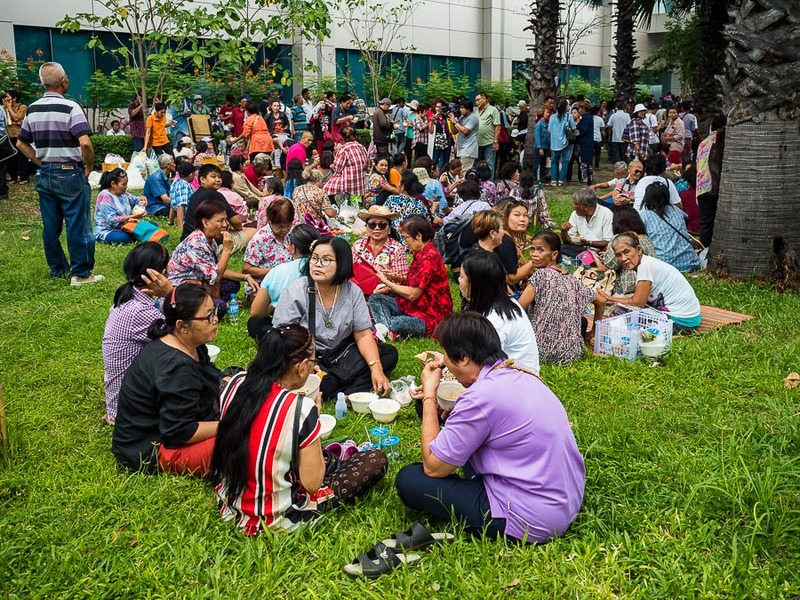 Both Red Shirts (Yingluck's supporters) and Yellow Shirts (the anti-Shinawatra movement) have mobilized hundreds of thousands of people for protests before the coup. So a couple of hundred people at court today is not, in the great scheme of things, a big crowd.